This post is going to mention Toroceratops, but it's not actually about Toroceratops. I think the Toroceratops debate, and how it's going down in the paleo community, is a symptom of a larger problem in science generally: not waiting around. I'll use Toroceratops as an example: The paper describing the possibility that Triceratops and Toroceratops are synonymous just came out like two months ago, maybe less. What's more, this is the first time (AFAIK) that the idea has been broached in a scientific paper for all to see. This idea is in its infancy. But what boggles my mind is that many people, including those working in the field and fans standing by the sidelines, have actually made up their minds about it. And many of these people may have access to additional information, specimens, or people that can give them a more accurate read on the situation. But the rest of us can't. In a case like this, the primarily literature itself must make the case. Word of mouth is not enough. I'm happy to see that SVP 2010 will feature a surprising number of talks regarding Toroceratops because the idea will be further explored. This needs to happen--it's how science works. I've spoken with more than a few people who have told me that Toroceratops is most likely correct based on things they've seen, specimens they've worked on, or people they've talked to. I've heard the opposite from other people. That's all heresay. It's not public record until it appears in a scientific publication. I can't assess that information. All I can assess is what's been published. That's all anyone can assess. Inside information is inside baseball, and it's not something we can all see. An example of how science should work can be seen with Balaur bondoc. The paper was just published, and the authors suggest that this strange dromaeosaur was a bizarre predator that attacked its prey with four sickle claws and a nonfunctional hand. Well, Andrea Cau has written several posts on his blog, Theropoda, about the interesting idea that Balaur used all four toes to support a bulky belly like a therizinosaur. Nobody's coming firmly down on either side--this is an idea in its infancy, and all possibilities should be explored. Andrea has not been attacked for suggesting that the authors are incorrect or that there might be another explaination. Maybe somebody out there has a third specimen of Balaur that's more complete that can prove one or the other, but it hasn't been published yet, so it's not assessable. This is the opposite of what's happening with Toroceratops. My own posts regarding Toroceratops were simply explorations into the idea that it might be incorrect. I did not appreciate the surprising inflexibility of a few posters (in both Toroceratops posts) with regards to the idea that other explainations were possible. And again, even if those people have access to more information, it doesn't matter: I can only discuss what I have access to--what's been published. The bottom line is that nobody should be making up their minds about Toroceratops or Balaur at this stage in both games. Wait a while. More information will be forthcoming, I'm sure, for both animals. Only when considerable evidence has been built up and published should anybody make up their minds about it. In science, extraordinary claims require extraordinary evidence, and that evidence will come...we just have to be willing to wait for it. P.S. Anyone else miss the Dino-Riders? Well said! I mentioned this in a comment on one of the previous posts, but I hate how some people on a forum I frequent jumped the gun on this paper. One guy even suggested deleting Wikipedia's Torosaurus page, just because the paper was published. I was planning on posting something like this on my blog, but it looks like you beat me to it. Also, regarding Andrea's ideas on Balaur, I would love to read them, but unfortunately I have a hard time reading badly translated Italian. That's a very sensible way to look at things. Well said. What really really needs to be done is someone redescribe the Torosaurus specimens. Thank you Zach, for quoting the "Dodo-raptor" hypothesis suggested by myself (but also by Ville Sinkkonen and others). I'm sorry for the not-always perfect translator in my blog: I could write directly in English, but, as you can read here, my writing in your mother language is often rough... (I love how my mother language allows me to build detailed sentences and arguments). 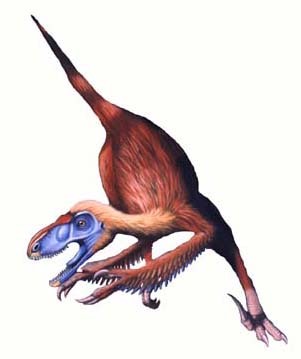 I would like to note that the "dodo-raptor" idea is not against Csiki et al. (2010) work, a paper that I consider very well done: in particular, the authors were the first to explicitly state that alternative positions of Balaur in the paravian tree would be possible, since they noted that the nodal support in their tree was relatively low. It is important also to consider that also my alternative positions are relatively poorly supported, and that additional evidence is needed before we can determine the position of Balaur. The "dodo-raptor" hypothesis is only an alternative explanation of the currently published data: it may be wrong, but I think that it can help the future researches. Yup, well said. I try to be careful about the language I use for just this point. And shouldn't we all know by now that paleontology is one of those sciences which requires us to hold back from getting married to one hypothesis too soon? I agree with you about the Theropoda discussions on Balaur. We don't even have Balaur's head! Part of the fun is looking at various plausible ways the animal may have been. I agree with what you've said here, Zach. It irked me to no end when I saw that TVTropes's "Stock Dinosaurs" page stated as a 'fact' that Torosaurus was synonymous with Triceratops. Thankfully, that's an editable source, so it's hopeful that a little damage control can be done before such a popular site spreads more misinformation. And yes, I too miss Dino Riders. Certain things are just cheesy enough to be glorious. This sounds like a reasonable argument, but I think it misrepresents the Scannella & Horner paper suggesting that it is some sort of symptom of a problem. Scannella & Horner clearly state that Ostrom & Wellnhofer (1990) suggested that "Torosaurus" might be just a male Triceratops, so the idea of synonomy was published at least 20 years ago. Further, they discuss numerous alternative hypotheses and conclude that synonomy is the most likely. Your suggesting that scientists have "made their mind up" is wrong. We can only falsify hypotheses in science, so all we can say is that currently the Torosaurus=Triceratops hypothesis is falsfiable, but has not been falsified under the most rigorous testing available. 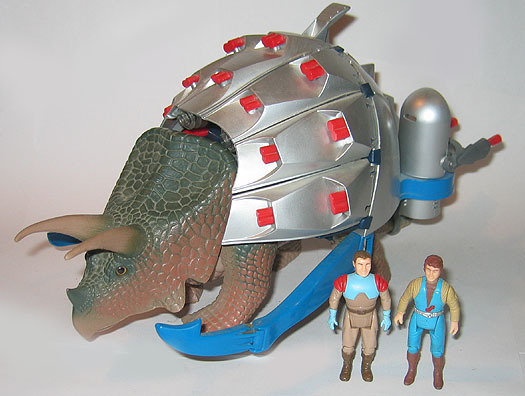 Right now, I think that Torosaurus=Triceratops is more likely than the alternative. You also can't say that only the primary literature counts, and then go on to claim that andrea cau makes some discussion his blog, since this is not the primary literature. it might be good discussion, sure, but it's not primary. And you CAN assess abstracts from meetings. The Triceratops anagenesis abstract has been publicly available online for over a year now. Meetings abstracts are considered a grey-area part of the primary literature, but they are citable (indeed, Scannella and Horner do so). I think this "lets wait for more evidence" approach panders to the negative. I don;t see the same criticism being leveled at newly named taxa such as Mojoceratops or Coahuilaceratops (to name but a couple ceratopsids). And the final point "extraordinary claims require extraordinary evidence, and that evidence will come..." suggests that extraordinary evidence has not already been presented. There are multiple lines of evidence that point towards synonomy, and these have been published. What evidence is there that the two are not synonymous? Just opinion. I don't understand why people think one person's mere opinion trumps our data? That isn't science. Also, I've often wondered how Stegosaurus mated, what with all those pointy plates and all. Perhaps that explains why it's tail was so flexible. But what about ankylosaurs? I would imagine stiff-tailed forms like Euoplocephalus would have a hard time maneuvering their weaponry while attempting to mount. There are a number of essays with some insights on dino-related subjects. Are they scientifically valid? I think abstract exist in a gray area for a reason. You don't get the whole story in an abstract, many abstract don't offer much more than teasers, and very many leave out the conclusion. In assessing taxon establ;ishment and/or identification, physiscal evidences (i.e. anatomical, histological, geo-temporal, etc.) can yield misleading results (here is the link for such an example: http://onlinelibrary.wiley.com/doi/10.1111/j.1556-4029.2006.00368.x/abstract; article by Miller and Bell, 2007). The best way to prove that the two taxa are synonymous is through biomolecular analysis. As someone from the field of animal genetics, I have seen considerable amount of literature in which two taxa have superficially similar skeletal anatomy and histological structure, yet has been shown to be distantly related by biomolecular techniques (i.e. polypeptide sequence analysis, DNA analysis). Since Horner already has the largest collection of Triceratops and Torosaurus fossils, I don't think that it would be bad if they tried to search for soft tissues preserved in those animals' remains and subject those to peptide analysis, or, if enough DNA can be recovered, to genome analysis. As shown in the biomolecular analysis of men and chimps, even a tiny 1% difference in the genome of the two is more than enough to separate them as distinct genera. My point is, where is the biomolecular basis of their claims? From us in the field of genetics, Horner and Scanella's claim about the synonymy of Triceratops and Torosaurus stands on top of sand, not rock. They need to substantiate their claim with DNA evidence, or at the very least, polypeptide sequence evidence. ....and to add that abstracts from conferences may not necessarily reflect the contents presented in the actual talk/poster because the abstracts were written months before the presentation. I don't mean to offend those scientists conducting this research. I know that finding peptide and/or nucleotide sequences from fossils is still difficult even with modern technology. What I'm saying as someone from the perspective of genetics is that whenever possible, scientists should verify their claims about the synonymy of two animal taxa through molecular analyses in order to confirm the examinations on physical aspects(i.e. skeletal anatomy, histology, geo-temporal distribution). Even Jack Horner himself once advocated the use of such methods. A larger sample size will increase their chances of obtaining specimens with analyzable soft tissues. Since they already have sixty(?) or so specimens of Triceratops and Torosaurus, it would be worthy to verify the synonymy of the two through molecular techniques.